When will you like work done? Answer this simple math so we can avoid spammers. Chair City Oil sells, services, and installs the highest quality furnace-based and boiler-based heating systems available. Our team of experienced, licensed technicians is knowledgeable and highly trained, with years of hands-on experience. We pride ourselves with the best in house design and engineering. No two jobs are identical. Choosing the correct equipment is only half the job. A properly designed and installed system will provide trouble free, efficient operation for many years to come. The high quality of our design and installation adds value to your home and eliminates future problems. Every heating system installation begins with a free, no obligation estimate. We will visit and inspect the work you wish to have done. At this early stage we will often discuss several options you may not have considered that can help you make the best choice for your needs. Often there are more than one equipment makers that would work, usually they have pros and cons such as price, efficiency, or size to consider. Once we both agree on what solution is best for you we design the system on paper so we can accurately determine the material and labor costs. If additional options come to mind they will be shared with you for your consideration. With the best design and equipment determined we will give you your free estimate accurately describing everything we can do to satisfy your needs. We want your business. The price we quote is the best possible price we can give to provide you the quality and workmanship you will receive. Today’s oil heat is the most efficient and cleanest burning ever, with an AFUE efficiency rating that often tops out over 85%! Oil is a natural, high-efficiency fuel that produces more BTU’s more efficiently than natural gas or electricity. Buderus heating systems provide more consistent, more comfortable heat using far less fuel than conventional high-temperature systems. View Warranty. Peerless ECT Cast Iron Steam heat boilers. 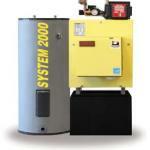 The most dependable steam boiler available. View Warranty. Peerless WB90 Cast Iron Forced Hot Water boilers. An excellent choice for a lifetime warrantied boiler. View Warranty. Super Stor Indirect hot water heaters for abundant hot water. More efficient than hot water coils. View Warranty. 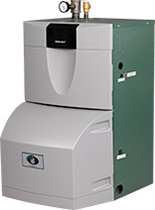 Kerr The Most Efficient Energy Star warm air furnace we sell, quiet and efficient. View Warranty. SlantFin Low profile, attractive baseboard with a baked finish and durable end caps and enclosures. Watts Radiant The best manufacturer of radiant heating hoses and components for efficient, comfortable radiant heat. Vaughn Durable, high efficiency insulated hot water storage tanks. The most dependable tank we install offering full 10 year warranty at no extra cost. View Warranty. For more information and a FREE home heating system estimate or consultation, call 978-632-4600 or use our contact us page now.